We love belts here at BestLeather, and we’ve had the opportunity to review some fantastic ones lately. Too many people settle for mediocre belts, despite the fairly reasonable price to upgrade to one you’ll enjoy for life. Brullen’s Drago1 Full Grain Leather Belt is soft, sturdy, stylish, and a great entry into this category. Brullen was founded in 2014. Founder Alex Harrera was driven by a frustration with low quality products found amongst designer brands. Inspired in that direction, there’s definitely some effort put into the fashion of their products. Brullen’s items have even been featured in GQ magazine! Brullen is focused on making quality products, “like they used to,” at great prices. ‘Brullen’ means scream or roar. Their Lions Head logo represents the company’s values (and looks really cool doing it). 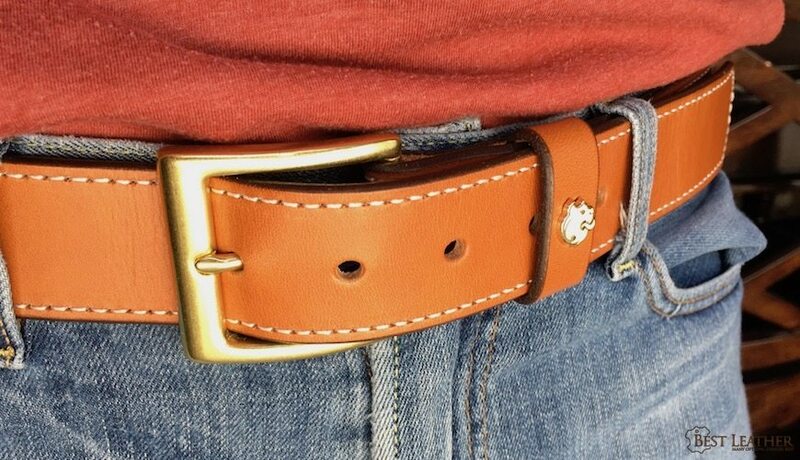 This belt is made with 10oz full grain leather that appears to be vegetable tanned. It’s impressively soft compared to similar belts. Edges are stitched all around, which not only enhances the look, but also inhibits stretch. The buckle is solid brass, and is held in place with a couple lines of stitching. This isn’t as strong as some metal hardware would be, but is still very strong and shouldn’t give out with normal use. The buckle itself is very strong. Edges are all painted a contrasting black color on the tan belt I have. We say this in just about every belt review, but a belt is a simple product. Long story short, it holds up your pants, and the Drago1 is no exception. Sometimes a well made belt can be a better experience to use than others, though. The soft leather feels great in your hands and makes the belt easy to manipulate. One thing I always look for in a belt is how smoothly it moves through your belt loops and the buckle, and the Drago1 glides easily. I really like the solid brass buckle, you can feel how strong it is. The leather keeper is unusually tight, but I felt this was probably good to support the soft leather. A 1.5″ belt may not fit through too many belt loops on formal pants, though it could fit in aesthetically. I have the misfortune of having a belt size that is almost inevitably right between standard sizes. My loss is your gain, however, as this usually gives me an idea of whether or not it’s best to favor sizing up or down if you’re between sizes like me. For the Drago1, I’d suggest sizing down. Of course Brullen will be happy to help out in making the right choice. As you might imagine of a product from a company inspired by designer brands and featured in GQ magazine, the Drago1 isn’t pure function. This is a great looking belt! I was torn on a couple of the color offerings Brullen has, but ultimately the tan just stood out. The white stitching is complementary to the tan leather, but the black edging is contrasting. I love the look of the silver Lions Head logo. These look killer with a pair of jeans. While the Drago1 isn’t the most flashy belt we’ve reviewed, it isn’t the most conservative either. You’ll have to decide if the look is for you, but Brullen informs me they’re working on some new designs with less adornment if you’re not sure about this one. I personally feel it stands out just the right amount, and love the look of the Drago1. The Brullen Drago1 Full Grain Leather Belt is an excellent option if you’re looking to upgrade your belt. 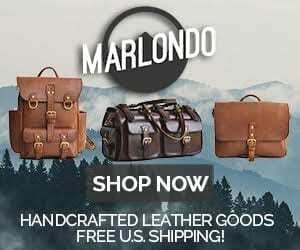 It’s made with quality leather and is well assembled. The look is great and will turn some heads. On top of all that, the price is great for a belt of its caliber. This is well worth the slight added cost over far inferior options on a lot of department store shelves. I recommend the Drago1 as a stylish upgrade to your wardrobe.